Christoph Croisé (1993 *) is a cellist with international concert activities. At the age of 17, he made his debut at Carnegie Hall New York, where he has performed regularly since then. Further appearances have taken him to renowned concert halls such as the Tonhalle Zurich, the Konzerthaus Wien, the Philharmonie Berlin, the Wigmore Hall London, the Munich Residence, the Capella St. Petersburg, the St. Petersburg Philharmonic and the Baku Philharmonic. As a soloist he performed with the Musikcollegium Winterthur, the Symphony Orchestra St. Petersburg/Russia, the Bernese Symphony Orchestra, the State Symphony Orchestra Baku/Azerbaijan, the Camerata Switzerland, the Munich Radio Orchestra, the Camerata Zurich, the Southwest German Philharmonic Constance, the Sichuan Symphony Orchestra, the Symphony Orchestra of the Staatskapelle St. Petersburg/Russia, the Collegium Musicum Basel, the Orchestre symphonique de Mulhouse, the Tirana Radio Symphony Orchestra, the Chamber Orchestra of the State Bavarian Philharmonic, Orquesta Sinfonica de Michoacan, the Harbin Symphony Orchestra and the Budejovice Philharmonic Orchestra, Under the direction of M. Sanderling, M. Venzago, D. Boyd, L. Gendre, K. Griffiths, A. Guliyev, A. Ardal, M. Dones, G. Bria and D. Botinis. Several live broadcasts were broadcast by radio and television, such as the Schumann Cello Concerto with the Munich Radio Orchestra by Bayerischer Rundfunk in March 2013 and others by RSI, RTS, SRF, NDR and WMFT. He performed Christoph Croisé and others in chamber music. With Dmitri Sitkovetsky, Mayuko Kamio, Alexander Zemtsov, Bartłomiej Nizioł, Sergey Ostrovsky, Oliver Schnyder, Oxana Shevchenko, Nikita Mndoyants, Lorenzo Soulès and Alexander Panfilov. Christoph Croisé is a welcome guest at numerous festivals such as the Festival “Musical Olympus” in St. Petersburg, New York and Baku, the Lucerne Festival, the Davos Festival “Young Artists in Concert,” the Menuhin Festival Gstaad, the World Festival The Black Forest Music Festival, the Festival de Sully, the Belfast International Arts Festival, the Emilia-Romagna Festival and the Festival de musique de Wissembourg. Christoph Croisé received his first cello lessons at the age of seven from Katharina Kühne. He has been taught by Alexander Neustroev since 2007. Christoph has been studying with Wolfgang Emanuel Schmidt at the University of the Arts Berlin since 2013. He also received significant artistic impulses from Steven Isserlis, Michael Sanderling, David Geringas, Walter grimmer and Frans Helmerson. He is the winner of the Gold Medal with honors at the International Competition “First Berliner International Music Competition” 2017, the 1st prize at the International Competition “Schoenfeld International String Competition” in Harbin/China, 2016, the 1st prize at the International Competition “Manhattan International Music Competition” 2016, the 3rd prize at the International Carlos Prieto Competition Morelia/Mexico 2016, 1st Prize at the International “Salieri-Zinetti” Competition in Verona/Italy 2016, 1st Prize at International Johannes Brahms Competition in Pörtschach 2015, 1st prize at the international competition “Petar Konjovic” in Belgrade 2009 and first prize at the international competition “Ibla Grand Prize” in Sicily 2010. 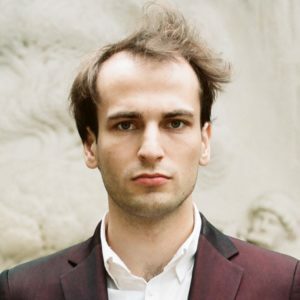 In 2015 and 2016 Christoph Croisé won the study prize of the Migros Culture Percent and has been accepted into the concert mediation of the Migros Culture Percentage since 2016. In 2017, Christoph Croisé was awarded the Swiss Ambassador’s Award. In May 2015, his debut CD with Oxana Shevchenko was released on the Quartz Classics label. Christoph Croisé is very thankful for the multiple scholarships granted to him over the last past years by the Lyra Foundation.